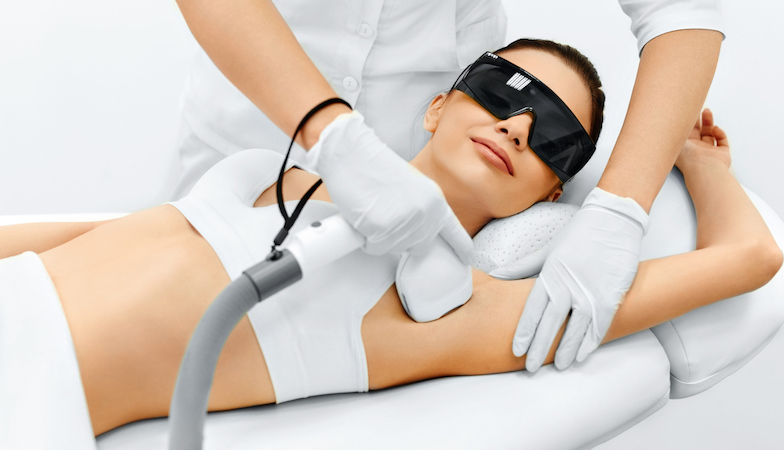 The laser light safely and gently passes through the dermis allowing the laser light to be absorbed into the hair root destroying the cells so they can no longer produce hair. Though hair re-growth has been prevented the laser does not injure the surrounding skin and the procedure is virtually pain-free. Other than white and grey hair, all hair colours can be permanently reduced through treatments. Dark hairs are most easily treatment due to the high concentration of melanin that gives maximum absorption. The Ecolite software allows the operator to adjust the treatment parameters for different hair and pigment types according to the client’s individual requirements. As the energy is being absorbed, the discomfort depends upon the concentration of melanin in the epidermis and the hairs combined. Consequently there will be more sensation in darker skin types and those with dense hair. No Anaesthesia is required and most patients describe the pain as moderate and acceptable. Most clients find the Ecolite IR diode pain-free treatment extremely comfortable with very little discomfort. Some clients describe the sensation as a soothing hot stone massage. Once the hair follicle is successfully treated, it cannot grow new hair. However, there are invariably a few hair follicles that manage to partially escape the laser during each treatment. Some of these follicles may be only stunned and will be retreated. A few minutes after the treatment, there are various indications of the effectiveness of the treatment. These include: the colour of the hair becoming charcoal, the hair expanding in size or a red ring around each follicle. These are good indications that sufficient hearing of the follicles has taken place. However, this is not always seen and many patients have great results without the past treatment signs. The Ecolite IR diode laser is completely safe, and thus, no special precautions are needed apart from glasses and for the brightness generated from the handpiece. The skin of some patients becomes quite red immediately after treatment and very rarely small blisters as from excessive sun exposure can occur. However, most patients experience no side effects at all, and any of the described skin reactions should disappear within hours to a few days. Unlike electrolysis, Ecolite treatments are not invasive. In general, laser procedures have a low risk of adverse side effects. The following potential temporary side effects are considered normal for the first few days. Some clients experience pigment changes in the skin colour. if this occurs, the skin will typically return to normal pigmentation over time, however in rare cases may persist permanently. All treatment results are individual. If you exposure your unprotected skin to UV light before and after treatments, you are seriously increasing your chance of adverse side effects, including burns and discolouration, so avoid unprotected sun exposure for 4-6 weeks before and after with an SPF 15+ sunblock. During your consultation, your hair and skin will be assessed and you will be recommended a bespoke program that will offer you the best results for your needs. Only hair in the growth phase can be treated. The number of hairs in the phase varies from 20 percent to 70 percent depending on the hair site. The lengths of the growth cycles also vary from 6 to 24 weeks depending on the body site. For most patients, three to seven treatments are sufficient to permanently reduce an area of hair up to 85 percent. After the first treatment, most clients get a significant reduction in hair density as new hairs tend to become finer. It is important to know that the first treatment is believed to synchronise the anagen (growth) phase of the non-anagen hairs. This may cause what seems to be re-growth, but actually just sleeping hairs starting to grow at the same time (new growth). This in turn makes the treatment(s) more effective. The hair growth cycle will slow throughout the laser course as there is less blood flow and nourishment to the hair site. The growth may slow to months or even years before new hairs show up. This is why maintenance is required after the initial course. All treatment results are individual. Clients should avoid tanning for 1 month prior to the treatment. Immediately after each treatment session, the skin is particularly sensitive to UV light and strong sunlight should be avoided for 4-5 days. Research shows that the majority of people treating standard areas such as the bikini or legs achieve 80-85% hair reduction on average. TO MAINTAIN YOUR RESULTS AND LENGTHEN YOUR HAIR-FREE PERIOD, WE RECOMMEND A YEARLY FOLLOW UP SESSION TO MAINTAIN YOUR DESIRED RESULTS. Some hairs will appear ‘shrivelled’ and others may appear unaffected. This does not mean the treatment has not been successful as the Ecolite IR Diode Laser generally treats the hair below the skin surface. Damage to hair occurs deeper than some other lasers, which enhances treatment safety and efficacy.